Cavities are a major source of pain, and they can also lead to tooth loss. The process of tooth decay that leads to cavities will occur in various stages, and the first stage involves the introduction of sugary foods to bacteria that live in the mouth. Hundreds of bacteria strains exist on the teeth, gums, and tongue, and some of these are beneficial, and others are not. The sugar will help the bacteria to thrive, setting the stage for damage. The bacteria will produce acids when it feeds on the sugar, and this acid will adhere to the bacteria, food particles, and saliva to produce plaque. This tacky substance will work to damage the protective layer of enamel on the tooth’s outer surface, and when a small opening forms in the enamel, the cavity has now begun to form. The acid and the bacteria will next burrow through the tooth’s dentin, the bone-like substance that makes up the majority of a tooth’s structure. Next, the bacteria will eat its way to the pulp. At this stage, the underlying bony structure of the tooth can become involved, and the pulp can become agitated. This may cause the body to send white blood cells to the area, causing an abscessed tooth that will require a root canal. Key symptoms at this point will be sensitivity when biting down and a toothache. Cavities do not form overnight, in fact, it can take months or even years for them to occur. A person’s mouth will normally rest at a pH 7, and the environment needs to dip below that number to become acidic, allowing plaque to affect the teeth. This will usually only happen in spurts and is the reason why cavities take so long to develop, though this can vary, as some people are more prone to developing cavities than others. Still, this lengthy process gives people a window of time to reverse the effects of sugar and bacteria in the mouth. The first important step is to eat a well-balanced diet that is low in added sugar and to avoid sugary drinks. Next, brushing will interrupt the development of cavities, especially after consuming foods such as crackers, bread, juice, and milk. It must be remembered that tooth decay will pick up where it left off when conditions become acidic again, so you can also rinse your mouth out with water after a meal if you are unable to brush. Be sure to make flossing a part of your dental hygiene routine, as this will remove food particles that become trapped between your teeth. Use a brand of toothpaste that has fluoride, because this substance reduces bacteria’s ability to produce acid, and it will prevent the loss of minerals in teeth. You can also drink water that has fluoride added to it. 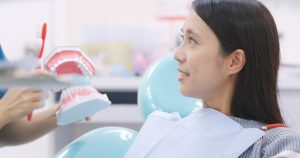 We welcome you to visit our Coconut Creek office to discuss any further questions you may have about how cavities form, and we also encourage you to schedule regular cleanings with Dr. Keith Schwartz to ensure good dental health.